The conflict or potential conflict between the United States-Israel and Iran seems to be heating up. 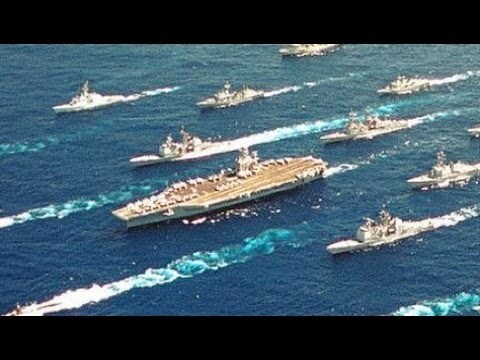 First Iran has naval exercises and threatens to close the straits of Hormuz in retaliation for tougher sanctions on Iran. Then an Iranian scientist is assassinated in what can only be called an act of terrorism. Most people are speculatingâ€”I mean, most pundits and analysts are speculating that this is an act by Israeli Mossad or American intelligence agencies or both. And then war games planned between the United States and Israel, major war games, calledâ€”get thisâ€”Austere Challenge 12 is the name of the drill. Well, now all of a sudden they’ve been canceled, we’re told, because they don’t want to heat up or intensify the conflict with Iran. It’s all beginning to sound like an episode of the American TV show 24, except there’s a real tragedy here, the assassination of the Iranian scientist, and his young family who lost a husband and a father. Now joining us to talk about all of this is Gareth Porter. Gareth’s an investigative journalist and often-contributor to The Real News Network. Thanks for joining us, Gareth. GARETH PORTER, INVESTIGATIVE JOURNALIST: Hello again, Paul. JAY: Alright. So I guess make some sense of all this. I guess let’s pick up theâ€”start the story with the assassination of the Iranian scientist. And then I guess we get to the cancellation of the war games. PORTER: Well, the assassination program in Iran has been going on now for a few years. And what is really very clear about this, first of all, is that the Israelis conceived the idea. They are the ones who’ve been carrying it out. The Israelis had the idea. They sold the idea as somehow slowing down the Iranian nuclear program by hitting the nuclear scientists. But, in fact, it’s become quite clear that what they’re doing here is not really slowing down the program, because they’re not really killing dozens and dozens of scientists. They’re killing a very few scientists. And they’re doing so in a way that suggests that what they really want to do is provoke Iranian ire at the United States in particular and try to sparkâ€”. JAY: Well, Gareth, before we get into that, just back up a step. How do we know it’s clear this is Mossadâ€”Israeli? We know Iran has accused Israel, United States, and Britain of being involved in this. How do we know this is Israeli? PORTER: Well, there has been a series of reports here that really nail this down in the last several days. Eli Lake reported for the Daily Beast a few days ago that Mossad agents were bragging, actually, at the margins of a recentâ€”what they call a strategic dialog between the United States and Israel, which took place in December, saying, you know, talking about, you know, how it’s not a good idea for someone to be associated with the Iranian nuclear program these days. And then there is aâ€”just today, The Telegraph had a long story that made it clear that there was evidence that this was Mossad. There doesn’t seem to be any question about that. JAY: ‘Cause, I mean, I guess I could add to that. The last time an Iranian scientistâ€”nuclear scientist was killed, I guess a year ago, a man by the name of Masoud Alimohammadi, Yossi Melman, who is one of the most respected national security journalists in Israel and writes for Haaretz, he said this could only be either Israeli or American that time. And then I guess the same logic applies this time. PORTER: Yes. And, of course, then I think we have the American response to this latest assassination in Tehran, which was that both the secretary of state, Hillary Clinton, and the spokesperson for the National Security Council issued really unprecedented denials, very vehement denials of U.S. involvement in this assassination or any other assassination in Iran. They had previously not gone to that length to make clear the United States is not involved in this program. But it seems, now, that the Obama administration has concluded that Israel’s strategy is indeed one of primarily trying to raise tensions between the United States and Iran, with the intention of hoping that there will be an incident that will spark off escalated violence and ultimately a war between the United States and Iran. PORTER: Yeah. This is an extremely important development, because the U.S. military has been building, year after year, closer and closer cooperative relationships with the Israeli military ever since 2001. In fact, the United States and Israel have been staging war games every other year. And these are major exercises involving hundreds to thousands of U.S. troops and a similar number of Israeli troops. And this new war game or military exercise which was scheduled for April was going to be bigger than any of the previous ones. And more important, it was going to focus on the integration of U.S. radar, highly powerful radar operations, with the Israeli antimissile systems, particularly the Arrow, the new Arrow system, the Iron Dome system. And so to be able to detect at the earliest possible stage and to shoot down incoming missiles was the purpose of the game. And it was clear that this was aimed at a scenario in which Israel had already gone to war with Iran and they were going to be shooting down Iranian missiles retaliating against Israel. JAY: Of course, they’d also be concerned about missiles coming, they assume, from Hezbollah, ’cause Hezbollah has bragged about being able to target any particular building in Israel that they want. So this issue of missile defense is rather important for Israel. PORTER: It would be both Hezbollah and Iranian missiles. You’re correct. So these war games, as you say, called Austere Challenge 12, are really much more important than any previous one, precisely because of the signal that they would send to the Iranians that the United States is in fact a full partner with Israel in the scenario of a war between Israel and Iran, which clearly would only begin with a strike against nuclear facilities by the Israelis. JAY: So what’s the signal of canceling the them, then? PORTER: Well, the signal that is now being sent, it seems to me, at least, and I thinkâ€”you know, Jim Lobe and I are doing a piece on this this evening, which’ll be published this evening, that the signal that’s being sent is that the United States now realizes that it is jeopardizing the peace and stability of the region by sending this kind of a signal, by on one hand entering into a major military exercise involving a scenario of Israeli war with Iran at the same time that the Netanyahu government in Israel continues to hold out, refuse to agree that it will cooperate with the United States and give the United States a prior warning or prior information about any plan to attack Iran. And, of course, the importance of that is that that means that the United States would have a harder time or would not be able to exercise a veto over an Israeli attack, which in the past it was understood the United States would be able to do that. So on one hand, the United States, in the scenario of participating in this game, would be seen as a full partner, while at the same time the Israelis were threatening an attack unilaterally and dragging the United States along with them. JAY: So have we heard from the Republican Party at all yet on this? I mean, is this going to now be Obama abandoning Israel and rhetoric as such? PORTER: Well, I think it’s very possible that that could be a theme that you would hear from particularly Newt Gingrich, who is extremely close to Netanyahu, who shares an American neocon Jewish big moneybags figure with Netanyahu, Sheldon Adelson, and who is obviously somebody who is ready to pick up the most extreme pro-Israeli and anti-Obama theme. So, yes, that’s quite possible that we’ll hear that. But I think what is important here is that the Obama administration has understood the danger that it has put itself in by this degree of military cooperation in the absence of getting the Netanyahu administration to agree that it will no longer threaten to carry out unilateral action against Iran. JAY: Well, I guess we’ll see how this all unfolds. In our previousâ€”. PORTER: Well, by the way, I think one more point, just along this line, is that the chairman of the Joint Chiefs of Staff, Army General Martin Dempsey, is on his way to Israel this week. I understand that he arrives on Thursday. And I have no doubt that part of what he’s going to be doing during his stay in Israel is to say to the leadership of the Israeli military that you have a choice. If you want the United States to participate in any such military exercise in the future at all, the Netanyahu government is going to have to commit itself to collaborating, to cooperating with the United States in informing it way ahead of time that it is thinking about an attack on Iran. That is, of course, what the Netanyahu government does not want to do, because it knows that it will then be subject to a political veto by the U.S. government. But that, I think, is the implication of this decision, despite the fact that, by the way, both sides have apparently used the cover story that this was a mutual decision based on the desire of both sides not to heat up the tensions with Iran. JAY: Well, I guess, if you’re sitting in President Obama’s chair looking at theâ€”on the edge of the unraveling of Europe and perhaps triggering another global financial meltdown, if you were to add to that an attack on Iran and the closing of the straits of Hormuz and the price of oil going through the roof, that would almost be a perfect storm, assuming you’re trying to get reelected in 2012. PORTER: Well, absolutely right. I mean, that is a big part of the picture here. And, actually, I think that it is one of the developments here alongside the latest assassination by the Israeli Mossad in Iran. I think it was the Netanyahu government’s successful forcing of this new sanctions policy, that is, sanctioning the crude oil sector of Iran, the exports of crude oil from Iran to Europe and Asia, and sanctioning the Central Bank of Iran, which the Obama administration was dead set against in November but was forced by the Congress, acting under pressure from the Israeli lobby, to pass legislation to basically force the issue. The Obama administration had to go along with that, but clearly it was not happy with that. And I think that that was part of the reason that Obama has come around to the conclusion that it’s really time to push back against Netanyahu.